ELEFANT GERMAN HEAVY TANK DESTROYER. The German heavy tank destroyer Elefant was armed with a powerful 8.8cm L/71 gun which could knock out T-34 tanks at a distance of 2,000m, protected by armor up to 200mm thick, and equipped with advanced features such as a hybrid drivetrain. It had its roots in the Porsche-designed Ferdinand, which was first deployed into combat during the Battle of Kursk in 1943. The lessons learned from that battle resulted in modifications including the addition of a commander's cupola, a machine gun for infantry defense, and better tracks and the enhanced vehicle received the new designation Elefant in February 1944. Elefants were deployed to Italy and the Eastern Front, where they continued to defend against Allied forces until the final skirmishes of the war. 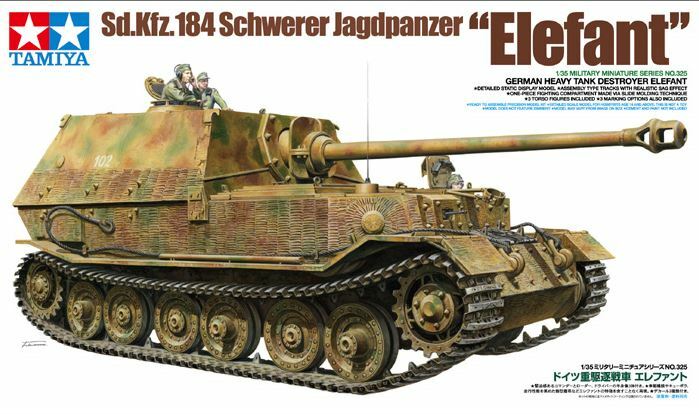 About the Model Length: 236mm, Width: 97mm The imposing form of the Elefant, including its 8.8cm gun and large fighting compartment, has been accurately reproduced based on a thorough study of an actual museum example. One-piece fighting compartment is made via slide molding technique. The main gun, engine grilles, and detailed suspension are designed to ensure easy assembly. The tracks feature one-piece straight sections with realistic sag effect. Kit comes with commander, loader, and driver torso figures. 3 marking options included to depict vehicles deployed to the Italian and Eastern fronts.